« Christmas Eve (Isaac) Newton blogging: My man Izzy’s War on Christmas. Ron Paul may not believe in evolution, but…. the question is, does evolution believe in Ron Paul? Ed Brayton over at Dispatches from the Culture Wars just posted this Ron Paul video, in which the good doctor declared his sure knowledge of the creator and his dismissal of the theory of evolution as that old fraud, “just” a theory. I’m sure that all the usual good voices will rip Paul the various new orifices indicated on the larger issue that his views on evolution are nonsense. In any event, I think selection will take care of this pretty quickly anyway — I see nothing that suggests Paul will survive too long in the political ecosystem he now inhabits, and I think that the attention he has begun to bring on American libertarianism’s ugly sides — its strains of racism; its “I got mine, Jack” unloveliness; its flat earth economics and so on — will help reduce the fitness landscape for his faction as well. But just to repeat what needs to be said everytime this kind of garbage comes up: a theory is not a guess, goddammit! Listen up, political boys and girls: The word “theory” in the sense used to modify words like “quantum;” “gravity;” “solid state;” and…wait for it…”evolution” — has a specific meaning in science. It refers to a body of knowledge that has identified specific patterns in nature whose behaviour can be shown to obey law-like statements. Such theories make specific predictions that can be confirmed by observation and experiment. Theories in this sense have been shown to be valid to the limits of current observation and experiment. They are superceded when (a) new abstractions come along that successfully encompass the older theory in a framework that can explain more of nature than the prior version; and/or (b) when new observations or experiments establish the limiting cases beyond which the older theory cannot account for what has been measured. Short form: a “theory” is something that tells us a lot about some part of the material world. It expresses real knowledge, “truth,” up to quite clearly defined limits of error or ignorance. Paul is or was a doctor, so my guess is that he knows this perfectly well. Even the minimal real scientific education required to get into med school gets you this far — so much for his straight shooter’s rep. Most likely anyone who reads this blog knows it too, so I apologize for preaching to the choir. 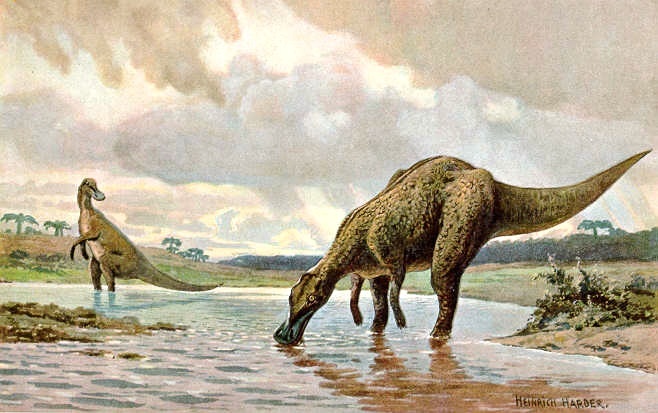 Image: Heinrich Harder,”Hadrosaurs” 1916 — a painting for a set of 30 collector’s cards in a set titled “Tiere der Urwelt” (Animals of the Prehistoric World). Source: Wikipedia Commons. This entry was posted on December 28, 2007 at 12:05 pm and is filed under evolution, political follies, seriously. You can subscribe via RSS 2.0 feed to this post's comments. You can comment below, or link to this permanent URL from your own site. The problem is that so many people want to remain ignorant. And they’re worried about what’s missing from my life.